Enriched Air Nitrox is the most popular and useful PADI Specialty Course, as diving with Nitrox significantly extends your no decompression time increasing your safety and fun. The benefits of Nitrox are even more remarkable when you do several repetitive dives, as it happens on MV Giamani Liveaboard. While the normal air is made by 21% of oxygen and 79% of nitrogen, with Enriched Air Nitrox we increase the percentage of oxygen in the mix in order to decrease the percentage of nitrogen which is the gas that affects our no decompression limits. Another instance in which diving with Nitrox can make a big difference is diving on a wreck, as the average depth of the dive will be deeper than a reef dive, and when diving with normal Air we often reach the no decompression limit way before we get low on gas, putting limitations on our enjoyment. 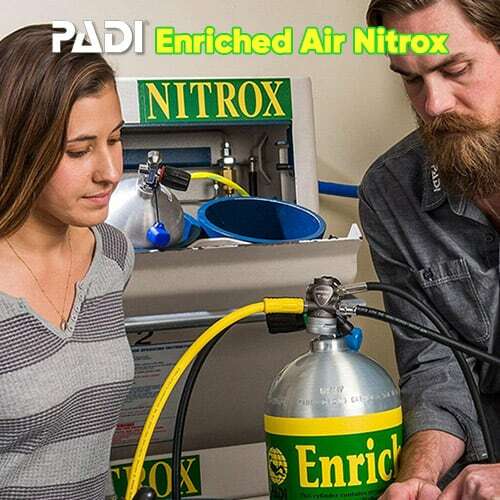 The Enriched Air Nitrox Course is almost entirely theoretical, as diving with Nitrox doesn’t involve any particular scuba diving technique while underwater. WHAT WILL YOU LEARN DURING THE NITROX COURSE? Unlike the PADI Open Water and Advanced Open Water Diver courses we offer, for the Enriched Air Nitrox Course we only offer one option, the Full Course on board. This is due to the mostly theoretical nature of the course, as during the MV Giamani cruise there will be plenty of time to go through all the Knowledge Development sessions with your instructor and cover the few practical aspects of the course. COURSE PRICE: 8,900 THB per person → BOOK NOW! TOTAL CRUISE DURATION: 4 days Available from 15 October to 15 May only! In order to do the Advanced Open Water Diver course you need to be already certified at least as an Open Water Diver. You can start the Advanced Course straight away after the Open Water course. No minimum amount of dives or experience required!